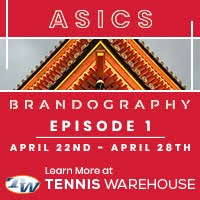 The last of my Adidas Easter Bowl recaps for the Tennis Recruiting Network are up today with a review of the ITF Grade B1 Closed Championships, won by qualifier Ron Hohmann and No. 3 seed Emma Navarro. I also spoke to the doubles champions: Will Grant and Tyler Zink and Navarro and Chloe Beck. Grant and Zink are playing here in Carson this week, are seeded second, and advanced to the quarterfinals with a win this afternoon. Navarro and Beck received a wild card into the WTA Volvo Open and won their opening match today, beating Jelena Ostapenko of Latvia and Darija Jurak of Croatia 1-6, 6-3, 13-11. Navarro and Beck saved match points at 8-9 and 10-11 in the tiebreaker to stay alive. Navarro, who received a wild card for winning the 18s Clay Courts last July, played her first round singles match Tuesday night, losing to Laura Siegemund of Germany 7-5, 6-4. Navarro had a set point in the first with Siegemund serving at 4-5, 30-40, but the German played three great points to hold, then broke Navarro in the next game. The third day of main draw matches at the ITF Grade 1 International Spring Championships produced several upsets, with both No. 2 seeds in the 18s exiting in the second round. Stefan Leustian defeated No. 2 seed Eliot Spizzirri 6-0, 6-2, with Spizzirri struggling with his ground strokes and his confidence throughout the match. "I thought I played pretty solid, pretty smart," said Leustian, a 17-year-old from California who trains in Florida. "Obviously he could have played better, everyone has their off days. There were a lot errors." Early in the second set, Spizzirri could be heard asking himself where his confidence had gone, a question generated by a first round loss last week at the Easter Bowl and by losing eight straight games to start this match. "I heard that, yeah," Leustian said. "When I heard that, I tried to keep pressing, tried to stay solid, because I knew he would mentally disappear. I knew he lost last week, but I thought he was going to come out with more urgency to win, to not have a bad week this week as well. I did as well, so I tried to be as solid as I could be." 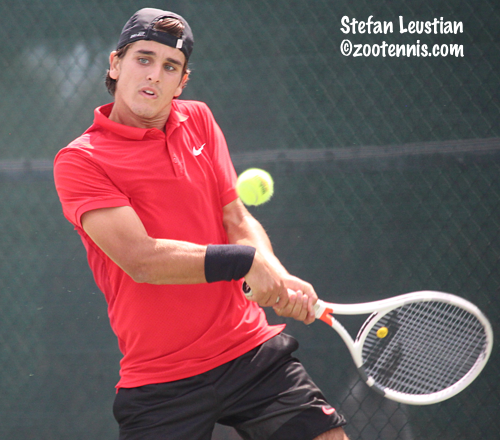 Leustian won two ITF Grade 4 titles right before the Easter Bowl, winning in Puerto Rico on Saturday and playing his first Easter Bowl match in Indian Wells on Monday. 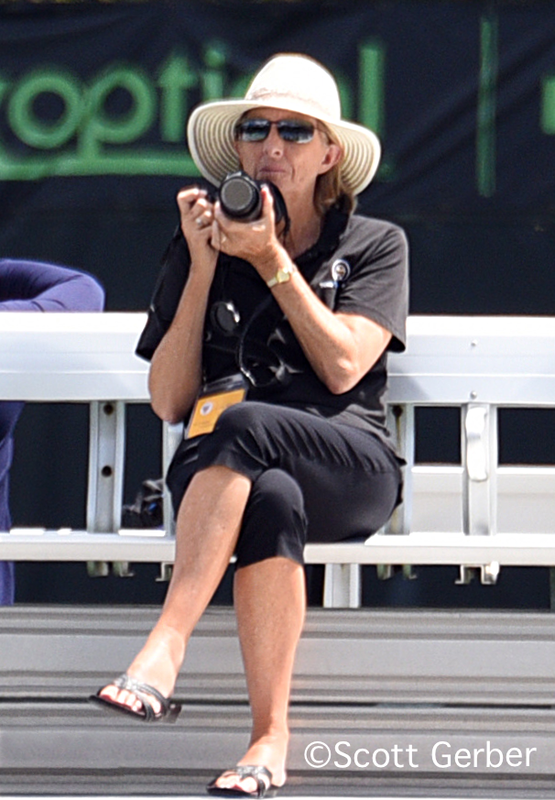 "I was pretty tired before that match, but Pierce (Rollins) played a good match as well," Leustian said. "I could have done better, but I was too tired." After the Easter Bowl loss, Leustian used his time in the desert to get ready for this tournament. "I practiced, ate well, hydrated, stretched, made sure I was ready for this week, try to have a good week," Leustian said. "So far it's turning out pretty good." Five other boys seed exited on Wednesday. Marcus McDaniel beat No. 7 seed and future Georgia Tech teammate Andres Martin 6-4, 7-5; wild card Ishaan Ravichander beat No. 11 seed Blaise Bicknell 6-7(5), 6-1, 6-1; Leighton Allen beat No. 16 seed Mark Mandlick 6-3, 6-0; wild card Aditya Gupta beat No. 9 seed Will Grant 7-5, 3-6, 7-6(2) and Stefan Dostanic beat No. 14 seed Keshav Chopra 6-1, 4-0 ret. Three girls seeds lost in Wednesday's second round, with wild card Connie Ma defeating No. 6 seed Charlotte Owensby 6-2, 6-2 and qualifier Victoria Hu downing No. 16 seed Hina Inoue 1-6, 6-2, 6-1. No. 2 seed Savannah Broadus was the third seed to go out in the girls draw today, with 14-year-old Nikita Vishwase taking a 7-5, 7-5 decision. Vishwase said the match was unusually choppy. "There was like no rhythm in the match, there was no momentum, no rhythm," said Vishwase, who trains in Arizona with coach Jeremy Coll, but represents India. "We both have big serves and big shots, so points were short, there weren't many long rallies. I saved a couple of set points in the first set, and I fought really well. I felt like at any point, it just could have turned the other way." Vishwase said her serve broke down at the start of the second set. "She kept breaking me and I kept breaking her for the first five games, but then I finally got a hold to go up 4-2," said Vishwase, who couldn't serve out the match at 5-4, but got another break of Broadus and was able to finish it on her second attempt. "But there were some return games where she played really well. There was not much I could do about it." Although she is only 14, Vishwase said she knows she can compete at this level. "I'm confident in my tennis and I know if I play my best, give it my best, I have a really good chance of winning," said Vishwase, who trains mostly with older boys. "I just have the belief that if I do my best and play good, I'm going to get really close to winning, and if I don't, I don't, and I just learn from it." In the 16s, both No. 1 seeds were eliminated in today's third round. 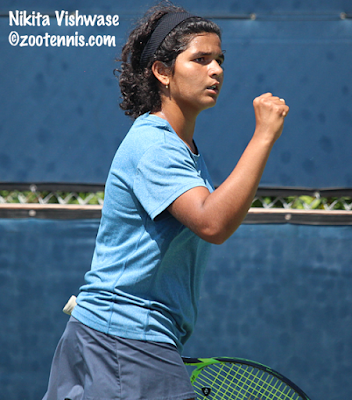 Ava Krug lost to Katelyn Hart 6-4, 7-5 and Andy Hernandez was beaten by Masato Perera 6-4, 6-4. Only two seeds remain in the girls draw--defending champion Anne Lutkemeyer, the No. 7 seed, and No. 6 seed Ria Bhakta. No seeds are left among the quarterfinalists in the boys draw. In the second round of doubles for the 18s, top seeds Hurricane Tyra Black and Alexandra Vagramov of Canada lost to Jaedan Brown and Rachel Gailis 1-6, 7-6(4), 10-6. No. 2 seeds Abigail Forbes and Kylie Collins also lost, to twins Allura and Marbella Zamarripa, 6-4, 6-4. Top seeds in the boys draw, Martin Damm and Toby Kodat advanced to the quarterfinals with a 6-4, 7-5 win over Leustian and Aidan Mayo. Thursday's order of play and complete draws can be found at the tournament website.